Growing up in a large family of 10, where my mother fed us well with very little gave me a great respect and love for food! So its what I’ve devoted my life to. 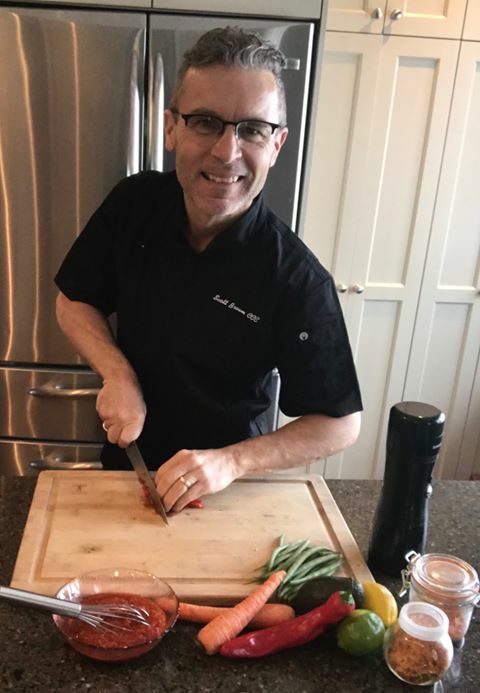 I spent my first 18 years developing my culinary skills traveling to kitchens around the globe including Switzerland, Italy, China, Japan and Southeast Asia achieving my Certified Chef de Cuisine (CCC)designation in 1996. I’ve played on many kitchen teams , from luxury hotels, private clubs and restaurants to owning my own Farm to Table operation in the late 90’s , back before it was even cool! What a blast that was! It still means a great deal to me to remain on the cutting edge of trends and new areas of food production, growing, innovating and of course, eating great food. This amazing journey in product development has enabled recognition awards for innovation, filed patents and the honour of working with high performance teams. Personal and professional growth continue to drive my passion for innovation and leadership. Last year I obtained my black belt in innovation engineering enabling me to work with you exploring and bringing your dreams to fruition. What big idea can we build together? Scott is a big picture thinker who is fearless yet mindful of his actions. I have seen him build strong teams by embracing diversity and empowering people. He lives and breathes an innovation mindset yet never loses sight of business goals - a delicate balance, which Scott is an expert at managing."